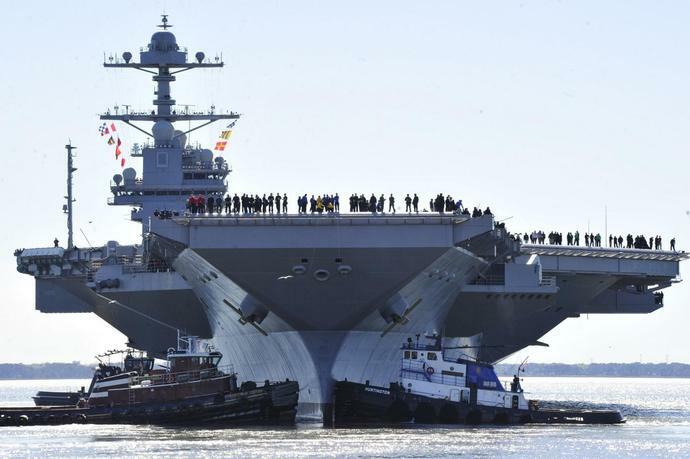 The U.S. Navy is doubling down on its new Ford-class supercarriers. In February 2019 the Navy paid Virginia shipbuilder Huntington Ingalls $15 billion to begin work on the third and fourth Fords. Buying two carriers at once could help the Navy finally to achieve its goal of having 12 carriers in service at all times, although under the worst-case scenario it might take the fleet until the 2060s to do so. But the Navy's hurry to acquire the ships belies lingering problems with the class's design. Not only is the whole program several years behind schedule--the cost of the Fords has ballooned--the Congressional Research Service explained in a February 2019 report. Several key ship's systems have proved unreliable, the CRS pointed out. The lead ship USS Ford, CVN-78, commissioned in 2017 and could deploy as early as 2022. CVN-79, the future USS Enterprise, is on schedule to commission in 2024. CVN-78 cost U.S. taxpayers $13 billion. CVN-80 cost $11 billion. Under the terms of the two-ship contract, CVN-80, the future USS Enterprise, should commission in 2027. The yet-unnamed CVN-81 should commission in 2030. Owing to efficiences of scale, the dual-buy could save billions of dollars compared to one-ship contracts. Still, overall program costs have grown. "The estimated procurement costs of CVN-78, CVN-79 and CVN-80 have grown 23.6 percent, 23.4 percent and 17.6 percent, respectively, since the submission of the FY2008 budget," the CRS reported. "Sources of risk of cost growth on CVN-78 included, among other things, certain new systems to be installed on CVN-78 whose development, if delayed, could delay the completion of the ship. These systems included a new type of aircraft catapult called the Electromagnetic Launch System (EMALS), a new aircraft arresting system called the Advanced Arresting Gear (AAG), and the ship's primary radar, called the Dual Band Radar (DBR)." Digging into a December 2018 report from the Pentagon's Director of Operational Test & Evaluation, the CRS detailed the problems with Ford's systems. EMALS is supposed to replace older, less-reliable steam-powered catapults, allowing the new flattops efficiently to launch a wide array of manned and unmanned aircraft. But EMALS doesn't work as advertised. "Testing to date involved 747 shipboard launches and demonstrated EMALS capability to launch aircraft planned for the CVN 78 air wing," the CRS pointed out. "Through the first 747 shipboard launches, EMALS suffered 10 critical failures. This is well below the requirement of 4,166 mean cycles between operational mission failures, where a cycle represents the launch of one aircraft." Equally troubling, since EMALS is plugged into the shipwide electrical grid, maintenance crews cannot isolate the system during operations in order quickly to fix it. If EMALS failed during combat operations, the ship effectively would have to shut down for repairs. "The process for electrically isolating equipment is time-consuming," the CRS explained. "Spinning down the EMALS motor/generators takes 1.5 hours by itself. The inability to readily electrically isolate equipment precludes EMALS maintenance during flight operations." AAG -- the system of wires and brakes that allow planes to land on the Fords -- also is unreliable, the CRS reported, citing DOT&E data. "Testing to date included 763 attempted shipboard landings and demonstrated AAG capability to recover aircraft planned for the CVN 78 air wing," the CRS stated. "Through the first 763 attempted shipboard landings, AAG suffered 10 operational mission failures (which includes one failure of the barricade system). This reliability estimate falls well below the re-baselined reliability growth curve and well below the requirement of 16,500 mean cycles between operational mission failures, where a cycle represents the recovery of one aircraft." Like EMALS, AAG also plugs into the shipwide electrical grid, "limiting corrective maintenance on below-deck equipment during flight operations," according to the CRS. Meanwhile, Ford's Dual Band Radar has been "plagued by extraneous false and close-in dual tracks adversely affecting its performance," the CRS stated. "Integration of the DBR electronic protection capabilities remains incomplete and unfunded. With modern threats, a lack of electronic protection places the ship in a high-risk scenario if deployed to combat. The Navy analysis noted that DBR performance needs to be improved to support carrier air traffic control center certification." The problems vexing CVN-79 have compelled the Navy to downgrade certain capabilities of CVN-80, the CRS explained. "Navy officials have stated that they are working to control the cost of CVN-79 by equipping the ship with a less expensive primary radar, by turning down opportunities to add features to the ship that would have made the ship more capable than CVN-78 but would also have increased CVN-79's cost, and by using a build strategy for the ship that incorporates improvements over the build strategy that was used for CVN-78." Reeling from the high cost and immense complexity of supercarriers such as Ford, in 2015 the Navy commissioned RAND, a California think tank, to study possible smaller carrier designs. In 2017 RAND concluded that smaller flattops, while cheaper, would be less survivable in combat than a Ford-class vessel would be. But the Navy could acquire a slightly less sophisticated version of the Ford class in order to ease acquisition, RAND advised. "There might be opportunities to reduce costs by eliminating costly features that only marginally improve capability."